The wait is finally over! The anticipation of the newest installment of the NHL series has been slowly building since EA Canada announced big changes coming to the franchise. This year saw EA Canada do something they’ve never done before. The developer surveyed core gamers and directly infused their feedback into the game, which was definitely needed. 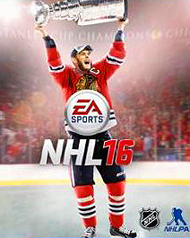 Last year’s NHL 15 was straight up awful. The actual gameplay was revolutionary in terms of the way players moved and reacted to real-life hockey situations, but everything surrounding that was just plain terrible. Several fan favorite features were absent or appeared partially completed, offline shootouts were abandoned, EA Sports Hockey League disappeared with no substitute in sight, and Be a Pro and GM modes were severely peeled back. That left gamers with a bad taste in their mouths and sucked the excitement right out of a franchise that has achieved greatness since its inception in 1991. Thankfully, NHL 16 makes up for all of those mistakes. EA Canada truly outdid themselves this year with a host of new features, exciting game modes, excellent visuals, and gameplay that’s actually enjoyable to play. Right out of the box, it finally looks and feels like you’re watching a real hockey game. Everything from skating strides, goalie reactions, and even the way the bench reacts puts players directly into the technical game of hockey. Defensemen finally mirror the puck carrier and react the way they would in real-life, goalie movements no longer feel like your dragging a bag of sand across the ice, lightening fast transitions from neutral zone turnovers are spot-on, and moving the puck across ice on passes or dumps feels like the real deal. The overall presentation of the game is pretty excellent. Everyone’s favorite hockey announcers are back and have been given a more polished feel in Mike “Doc” Emrick and Eddie Olczyk. No longer will the duo spit out random mouth garbage that doesn’t coincide with what’s actually happening on the screen. Additionally, goal celebrations feature all five players celebrating together, along with the classic fist bump along the bench, while additional arena elements are triggered when the home teams pokes one home. Some of those include rowdy fans going ballistic, the guy everyone loves in the 300/400-level screaming uncontrollably, official team mascots interacting with the crowd, and authentic team-specific celebrations that are unique to that particular arena. Playoff beards are also on full display and will mirror that of the actual player. In other words, a scrappy guy like Andrew Shaw won’t be able to flush out an epic face blanket like Henrik Zetterberg. 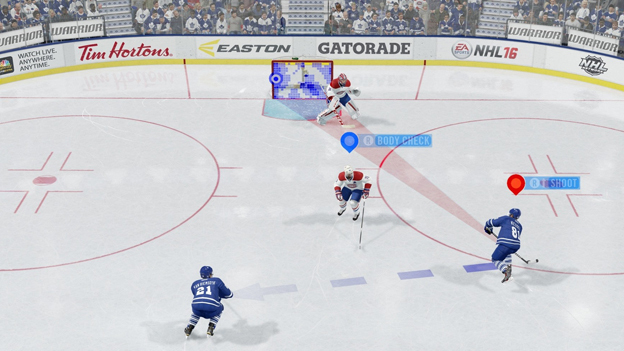 On-ice gameplay has been tweaked for the better, with the biggest improvement coming in the goal department. 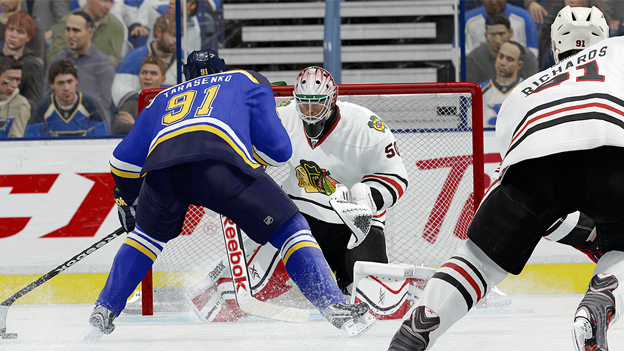 NHL 16 does an awesome job of providing players with a wealth of options for tickling the twine. Slap shots and wrist shots have improved accuracy, to compliment a much better release point . Deflecting big shots from the point are a little easier to pull off, not to mention they’re much more effective when compared to last year’s version. Players will also have the opportunity to stuff home goals in the slot and take advantage of juicy rebounds that don’t get gobbled up by the goaltender. Minor tweaks have also been made to the cheesy hash-mark drag goals and the all-to-famous wraparound instant-goal that have plagued versions in the past. Fighting is still pretty awesome in NHL 16, and you can antagonize just about anyone on the ice with a face full of glove or a cheap crosscheck to the back. The fighting simulation will remind you of the toughness and confidence these guys bring to the table in real life. Blast your opponent’s helmet off while delivering devastating blows or wrangle him to the ground if you’ve sparked a bout while controlling Sidney Crosby, who we all know can’t fight worth a beans. Celebrate while heading to the box or clutch your bloodied and bruised face as you glide your way to five minutes of shame. The On-Ice Trainer is a wonderful visual aid to educate new comers to the franchise. Not only does this new system essentially teach you how to play NHL 16, but it actually helps you better understand the game of hockey as well. This revolutionary training system starts you off at the bottom rung with basic shooting mechanics and face-off procedures. You gradually work your way up to basic passing, saucer passes, wrist-shots, and picking your corners on the goaltender. Eventually, the trainer will graduate you to the real thing and continue to provide tips as you make your way through a full game. The mind-blowing thing about the On-Ice Trainer is that the game will tell you exactly how to beat your opponent and succeed. It flawlessly blends into the background and continues to provide feedback on why you should have made the pass to the slot, why you got stoned by the goalie or what worked when you went top cheese and made him look silly. After time, the game will realize the training tips are no longer need as they become conditioned into your mind and become second nature. My suggestion would be to start with the On-Ice Trainer in anything but Be a Pro mode. Although very helpful within this specific mode, you may have a difficult time transitioning gameplay styles from controlling one player in Be a Pro to controlling five, six if you count the goalie with puck possession, in the other modes. If you have no use for any of the other modes that involve taking charge of all players, then by all means jump right into Be a Pro with the On-Ice Trainer. However, if you play a lot of GM mode or simple exhibition games, then avoid starting the trainer with Be a Pro.